Second, it’s in (deliciously) excruciating detail. He starts off with the reconstruction of Proto-Indo-European and wends his way forward in time following the migrations and history of the Indo-European people as it relates to not just the Germanic branch, which eventually produces English, but the other branches that have the most influence on it, namely Italic (which gave us Latin) and Hellenic (which gave us Greek). As of this writing, episode 27 has just been released. This episode ends with the collapse of the Western Roman Empire. In #2, the Angles, Saxons, and Jutes will invade Britain and the language we today call Old English will be born. While this might be a turn off to some, I found the history fascinating, engrossing even. There, the only two points that might turn some off, but neither of which I personally count as a negative. What do I like about it? I definitely love the amount of detail. I love history, and in particular ancient history, so learning about the early Indo-Europeans was great. I also love languages in general, so learning about the development of the other languages that would come to play such a huge role in English’s development was wonderful too. Naturally, as much of the early history is actually prehistory, some of it is uncertain or conjecture. Mr. Stroud is careful to mention when this is the case as well as any competing theories worth noting. He speaks in a clear and even voice. I never have any difficulty understanding what he’s saying or need to adjust the volume. The sound quality is very good. I don’t know what microphone he’s using, but if I ever decide to take up podcasting I should ask him. There is also a companion blog for the podcast. There you can find a post for each episode with a description of the cast and often supplemental materials like maps and images. You can also interact with other listeners – each episode post gets a few comments at least. Finally, the podcast comes out regularly. You can count on a new episode every two to three weeks. If you have an interest in history or the English language, you really ought to give this podcast a try. I also want to add that, because of the combination of sound quality, Mr. Stroud’s clear speech, and the subject matter, I’d also recommend this for English language learners who are at an intermediate or higher level. The only things that might confuse an English learner are some of the names of places and tribes/peoples. Let’s face it, few English courses are teaching students about the Hittites and the Carpathian Mountains. To be fair, a lot of these names are unfamiliar to native English speakers. So, if you’re confused about all the unfamiliar names, head over to the web site. Nearly all the geography-heavy episodes have a map or two you can look in the post that corresponds to the podcast episode. One last thing to mention, even though this is a podcast, you don’t need anything special to listen to it. If you want, you can just download the episodes in MP3 format and listen to them on your computer. Since you’ve read this far and can listen to it on pretty much any computer-esque device, you have no excuse. Go. This looks like a wonderful series. Reblogging from my friend Cary who offers an excellent review. Ugh. Yeah, what I wrote is jacked up. (Well, was, I’ve edited it now.) Thanks! He is a barrister, so I guess he knows how to get his point across! LOL. Reblogged this on Eirene Hogan. I love this podcast. It is so well presented. It encorporates fascinating history, a deep understanding of linguistics, and a talent at presenting complex information in a manner that is comprehensible and interesting. Anyway, thanks for a great review of one of my favourites. I totally agree with you about the excellence of this podcast. It’s just great to listen to whilst doing some exercise. 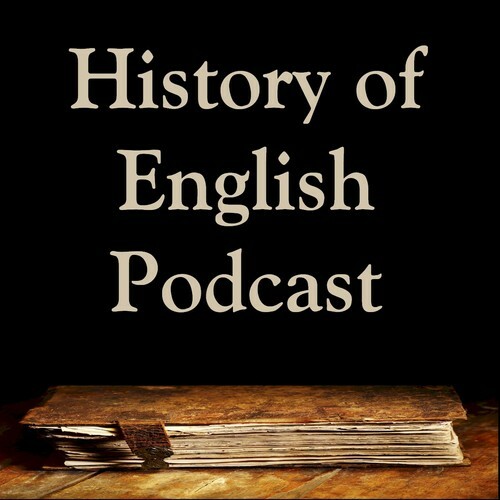 I love history and being an English teacher too the podcast helps explain some of the nuances of the language I’m teaching. Amazing!